Ingersoll Rand mdl. 2475 7.5Hp Vertical Air Compressor s/n 11204321 w/ 2-Stage Pump, 80 Gallon Tank. Husky 6.5hp Vertical Air Compressor w/ 2-Stage Pump, 60 Gallon Tank. Lift-Science mdl. BS-30/16 500kg Electric Pallet Mover s/n 060663. Haas 4th Axis 5C Rotary Head w/Pneumatic Collet Closer, Haas Brushless Rotary Controller. (120)Tecnara BT-40 Taper Tapping Heads and Tap Holders. Kennedy 8-Drawer and 7-Drawer Roll-A-Way Tool Boxes. Insert Milling, Turning and Boring Tooling w/ Carbide Inserts. 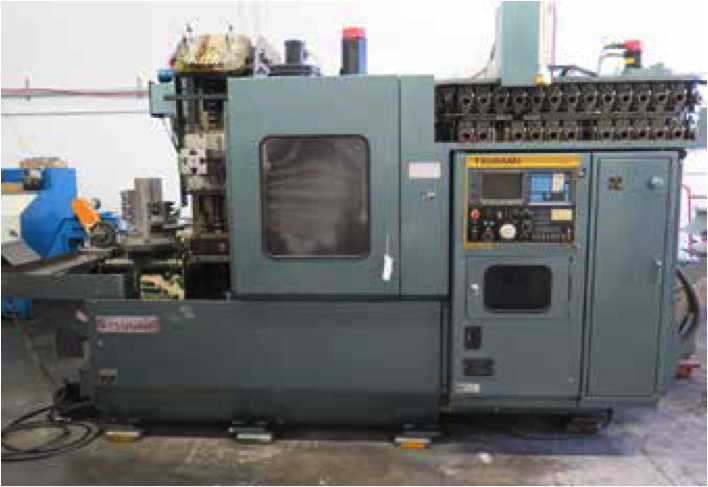 Drills, Taps, Endmills and Perishable Tooling. Deltronic mdl. DH216 16” Optical Comparator w/ Deltronic MPC-5 Programmable DRO, Digital Angular Readout, Surface and Profile Illumination, 5” x 15” Table, Stand. Mitutoyo 12” Digital and 12” Dial Height Gages. Fowler 0-1” Indicating OD Mic. Mitutoyo Blade, Anvil and Point Mics. Mitutoyo Digital and Dial Bore Gages. Interapid, SPI and MHC Dial Groove Gages. Mitutoyo and Starrett Depth Mics. 18” x 24” x 4 ½” 4-Ledge Granite Surface Plate.